Is your New Year's resolution to start packing lunches for someone in your family? Or packing healthier? Don't be intimidated - even packing just once a week is progress! 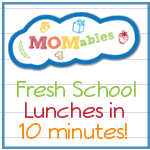 School will be starting up again in a week or so, so right now is a great time to look around for lunch packing ideas! 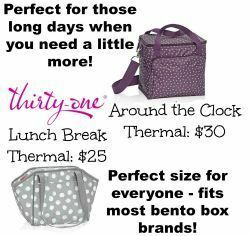 No matter how much effort you are able to put into it, anyone can Rock the Lunchbox! 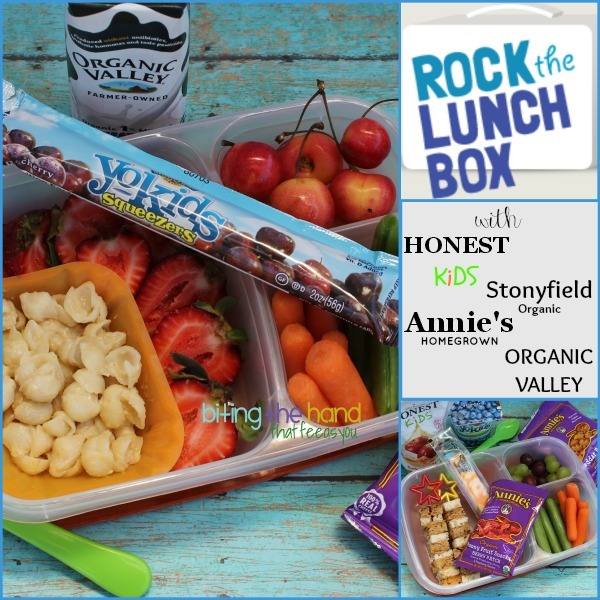 Annie's Homegrown, Stonyfield, Organic Valley, and Honest Tea all banded together to promote taking packed lunches to school with their site Rock the Lunchbox. 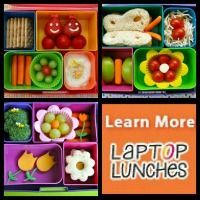 They created a site to go and upload your own lunch ideas, or to get inspired by others, whether or not you choose to pack their lunchbox-friendly products! [Disclaimer: I was given products/coupons for products for free to use and enjoy. Except the GF pasta. They sent a gluten one, so I had to go out and buy my own. They asked us to pack lunches within certain parameters, so please understand that these particular lunches were not designed for my kids. They were staged for the photos. Now, don't get me wrong. 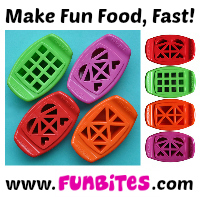 My kids did eat them - but each of these is way more food than either child would eat. And the carrots and peas may have done double-duty to appear in both lunches! So after the photo shoot, I put some of the foods back in the fridge for another time. Change up Your PBJ with Sandwich Bite Skewers! 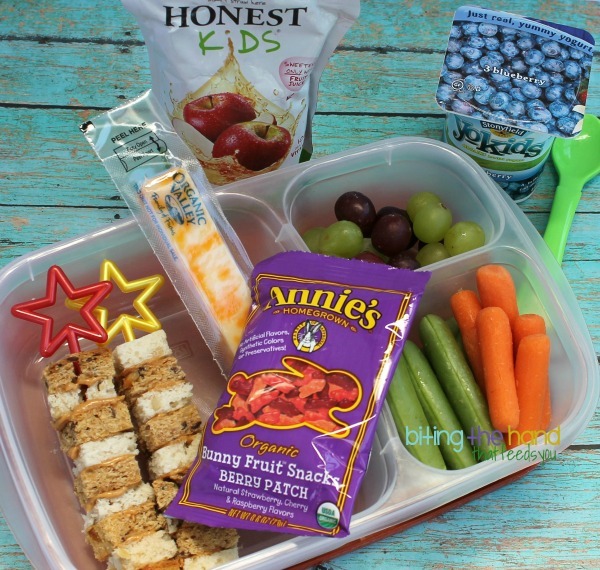 Honest Kids juice pouch, Stonyfield YoKids yogurt, Organic Valley cheese stick, Annie's Homegrown fruit snack bunnies, gluten-free brown/white bread peanut butter sandwich skewers; and organic grapes, sugar snap peas, and carrots. Although I've been known to make exceptions, I wouldn't normally send this many sweets in one lunch (sweetened yogurt, juice, and fruit snacks.) But the yogurt could be for snack earlier or later in the day. Leftovers to Lunch - Macaroni and Cheese! 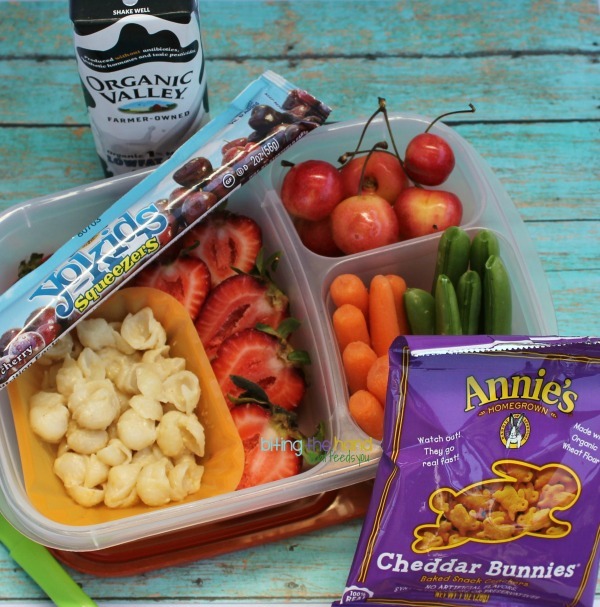 Organic Valley milk box (shelf-stable,) Stonyfield YoKids Squeezer, Annie's Homegrown GF white cheddar shells and cheese (with dried sweet potato powder mixed in,) Annie's Homegrown Cheddar Bunnies (not available gluten-free;) and organic strawberries, cherries, carrots, and sugar snap peas. When I made these this past Summer, we were trying Z on gluten again, a little a day, to see if she reacted. So I let her eat some of the cheddar bunnies, spread out over several snacks. But I made the gluten-free pasta so both girls could have some.